Hi, my name is Carol Sumbry, I work with dogs in the Southeastern Wisconsin area and am an Associated Certified Behavior Consultant (one of only four in the entire state certified with the IAABC) and Certified Professional Dog Trainer. I am also a Certified Meditation Teacher who believes in looking at dogs and behavior with a holistic approach. (See more under Meditation and Dogs). I would like to share a little about my background with you. I think some people are born animal lovers. That’s me. I got my love of animals from my dad. We often visited our local shelter and I always brought home the neighborhood strays until their owners could be located. I grew up with poodles but have fostered almost every breed out there over the years, specializing in shy and special need dogs. I even fostered a 2 legged poodle that was rescued from a puppymill! As an adult, when I was ready for my first pet, I knew it had to not only be a dog that needed a home but also a dog that wasn’t going to have an easy time finding a home. I rescued a senior cat named Charmin who lived with me until her passing. I also rescued Angel, a very shy racing Greyhound, and my love for sighthounds continued as I adopted a Whippet and an Italian Greyhound. I went on to foster hundreds of dogs, mostly shy, special needs or dogs with behavior problems and went on to adopt more over the next decade including three dogs from puppymills. In addition to enjoying life with my canine companions for most of my life, I also foster and help several non-profit animal rescues. 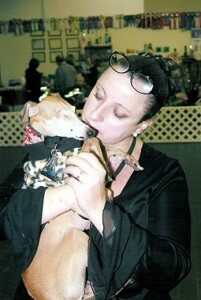 Serving as the WI representative for the Italian Greyhound Club of America, a national organization dedicated to rescuing dogs in need, I have fostered, trained, rehabbed and rehomed HUNDREDS of dogs in the last 2 decades. I also foster and train dogs for a local shelter where I work, Elmbrook Humane Society, and several other rescue groups including Greyhounds Only, Whippet Rescue, Papillion Rescue and Min Pin Rescue. While fostering racing Greyhounds in the past, I only worked with the shyest dogs known as “spooks” to help them gain confidence and make them more adoptable. Each foster experience has given me unique hands-on experiences with understanding our canine companions. The dogs have taught me more than any book or seminar I have attended. Although over the years, I have enjoyed therapy work, agility and lure coursing with my canine companions, my main goal is to have a strong bond and a mutually enjoyable relationship with my dogs through training. I enjoy helping other animal lovers learn how to have a well-behaved companion that they can truly enjoy living with! Working in rescue for over 20 years and in the shelter environment, I have seen so many dogs lose their homes through no fault of their own. These dogs were “very good at being dogs”. They jump, dig, bark and do all the things that make them a dog! We expect them to live in OUR human world so it is our responsibility to train them to do so. I am dedicated to that mission. I offer affordable options for fun, common sense, relationship based training in an effort to keep dogs in their homes for life and keeps owners happy!! Far too many dogs are surrendered to our shelters or abandoned and I would like to be part of the solution to help dogs and their owners to have a LIFELONG, mutually rewarding relationship. Dogs can make our lives whole and I look forward to sharing my love of animals with you and your companion! I offer private lessons and classes at Petlicious Dog Bakery. I also do in home private lessons, phone consultations, behavior consultations and teach classes at Elmbrook Humane Society in Brookfield, WI. I was voted Top Trainer in The Milwaukee Journal’s Top Choice Awards for Greater Milwaukee. We are fortunate to have many good trainers in our area but I am very grateful for those that nominated and recognized me for my passion and my work. Contact me to see what options are best for you and your companion’s needs. I’m here to help!